Turning 57 today is Archer Mayor, creator of Lt. Joe Gunther and one of the busiest men in mysterydom (in addition to writing, he serves as a volunteer firefighter/emergency medical technician, an assistant medical examiner for Vermont, and a patrol officer). His latest novel is The Second Mouse. Cornerstone: Re-enter Sir John (1932). Sir John Saumarez, master thespian and sometime sleuth, investigates an accusation of cheating at cards against his protégé, which turns deadly when the protégé’s landlady is murdered on a London street. The book’s extraordinary climax features Sir John confronting the killer via a silent film he has made with his evidence. Sir John debuted in Enter Sir John (1928), which was adapted as the Hitchcock film Murder! (1930), and also appears in Author Unknown (aka Printer’s Devil, 1930) and ’Vantage Striker (aka The Prime Minister Is Dead, 1931, written by Helen Simpson). Sadly, none of these works, nor Re-enter Sir John, are currently in print (hint to mystery small presses). British artist and writer Clemence Dane (1888-1965) wore many hats in her life. Called “a gallant old girl” by her longtime friend Noël Coward and believed to be the model for Madame Arcati in Coward's Blithe Spirit, she wrote the play A Bill of Divorcement (later made into a film starring Katharine Hepburn) and won an Oscar for her original story for Perfect Strangers (aka Vacation from Marriage, 1945) with Robert Donat and Deborah Kerr. She also was a contributor to the Detection Club’s round-robin mystery The Floating Admiral (1931). Australian-born Helen Simpson (1897-1940) founded the Oxford Women’s Dramatic Society and published novels, plays, and poems. She contributed to the Detection Club work Ask a Policeman (1933). Besides the Sir John series, her other mystery work includes Acquittal (1925); Cups, Wands, and Swords (1927); and Under Capricorn (1937), the latter made into the Hitchcock film of the same name. 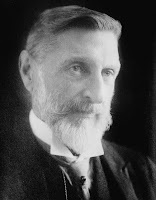 She married Denis John Browne, who became an eminent surgeon for London’s Great Ormond Street Hospital for Children and was the nephew of Australian novelist Rolf Boldrewood. "Geezer noir" aficionado and recent Anthony nominee Bill Crider turns 66 today. Happy birthday, John D. MacDonald. MWA Grand Master John D. MacDonald, creator of Florida PI Travis McGee, was born today in 1916. He died in 1986. His work adapted for the screen includes the celebrated Cape Fear (1962, 1991); "First Prize for Murder" (Studio One, 1957); "Hangover" (The Alfred Hitchcock Hour, 1962); "The Deep End" (Kraft Suspense Theater, 1964); and The Girl, the Gold Watch, and Everything (1980). For an appreciation of MacDonald's work by Washington Post book critic Jonathan Yardley, go here. 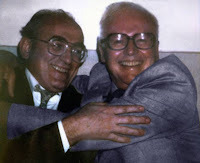 Photo credit: John D. MacDonald, right, with fellow author Donald Westlake, date unknown. Photo courtesy of Maynard MacDonald, for the Estate of John D. MacDonald. Raymond Chandler, creator of legendary PI Philip Marlowe, was born today in Chicago in 1888. He died in 1959. Go here for Peter Straub's interesting observations on Chandler. For a look at some vintage covers of Chandler's work, go here. Michael Connelly, the multitalented creator of detective Harry Bosch and lawyer Mickey Haller, turns 51 today. To listen to voicemail messages left for Bosch from characters in The Overlook and Echo Park, go here (the line seems to be blurring between fiction and reality...). A former prison inmate and a writer for the Works Progress Administration (WPA), Chester Himes, the creator of Harlem detectives Coffin Ed Johnson and Grave Digger Jones, was born today in Jefferson City, Missouri, in 1909. He died in 1984. Johnson and Jones were introduced in A Rage in Harlem (aka For Love of Imabelle; winner, Grand Prix de Littérature Policière) in 1957, followed by The Crazy Kill (1959), The Real Cool Killers (1959), All Shot Up (1960), The Big Gold Dream (1960), Cotton Comes to Harlem (1965), The Heat's On (1966), Blind Man with a Pistol (1969), and Plan B (1983). Jerome's "glorious art of self-advertisement" seems to resemble today's Blatant Self-Promotion (BSP). Lawyer, friend of Theodore Roosevelt and Oliver Wendell Holmes Jr., staunch opponent of censorship, and grandson of actress Fanny Kemble, Pennsylvania native Owen Wister was born today in 1860. His greatest claims to fame are his biography of TR, Roosevelt: The Story of a Friendship 1880-1919 (1930), and his novel The Virginian (1902), a cornerstone of the Western genre, or, as the New York Times put it, a "stirring novel of Western life [. . . it] undoubtedly will be read very widely." The reviewer was prophetic: At the time of Wister's death in July 1938, the New York Times stated that The Virginian had sold 1.5 million copies. It was adapted as a play and several films, including a classic one with Gary Cooper in 1929. Historian John Lukacs mourns the lack of a "true and startling biography of Wister" here. "...murder is no excuse for flabby toast." Happy birthday, Mildred Wirt Benson. Mildred Wirt Benson, the staggeringly productive author of the first seven and other Nancy Drew books, several Dana Girls novels, the Penny Parker mysteries, and many other books, was born today in 1905. She died in 2002. Benson was the first female graduate of the University of Iowa's School of Journalism, held a private pilot's license, and was a columnist for the Toledo Blade. She noted in a 1973 article for Books at Iowa that in her most industrious year, she "turned out thirteen full-length volumes under various pen names, writing the entire list of new books for one publisher." She also said, "...it seems to me that Nancy [Drew] was popular, and remains so, primarily because she personifies the dream image which exists within most teen-agers." Many of the original Nancy Drew books with the original cover art are available from Applewood Books. Noted thriller and horror author Dean Koontz (and his ten pseudonyms) turn 62 today. His latest works include The Good Guy and The Husband. You can find more information about his life and work in The Dean Koontz Companion, Dean Koontz: A Critical Companion, Dean Koontz: A Writer's Biography, and this interesting 1998 article from Publishers Weekly. John Ball, the creator of detective Virgil Tibbs, was born today in 1911. He died in 1988. He won an Edgar for the first Tibbs book, In the Heat of the Night (1965), which was followed by The Cool Cottontail (1966), Johnny Get Your Gun (1969), Five Pieces of Jade (1972; Edgar nominee), The Eyes of Buddha (1976), "One for Virgil Tibbs" (EQMM, 1976), "Virgil Tibbs and the Cocktail Napkin" (1979), Then Came Violence (1980), "Virgil Tibbs and the Fallen Body" (1982), and Singapore (1986). Said Ball in Twentieth-Century Crime and Mystery Writers, "I am not a 'message' author, but I believe in building books on ideas. For example, the idea behind In the Heat of the Night is that in any group of men a WASP is not necessarily the best qualified person present." Here are short excerpts from Ray Charles's "In the Heat of the Night" and Quincy Jones's "They Call Me Mister Tibbs." And here's Sidney Poitier saying the most famous line of the film version of In the Heat of the Night (1967). Many devoted mystery fans are serving in military units overseas and greatly appreciate donations of books. Two volunteer efforts that put books into their hands are Operation Paperback and Books for Soldiers. I've been sending paperbacks via Operation Paperback for about a year now, and the thank-you notes from the recipients have been most touching. Philip MacDonald: The Choice (1931). As a follow-up to my blog entry on Philip MacDonald's The Rasp, I'll feature another in the Anthony Gethryn series, The Choice (aka The Polferry Riddle and The Polferry Mystery). In The Choice, the wife of a doctor is found one stormy night with her throat cut. Now the occupants of the remote house are being bumped off one by one, and Gethryn, who has systematically eliminated possible suspects, is stumped as to the perpetrator of these crimes. When another of the house occupants is kidnapped, Gethryn and Scotland Yard embark on a wild chase, and Gethryn eventually figures out the answer. Like The Rasp, The Choice features paternal head-patting of female characters, although the kidnap victim, Susan Kerr, who is described as "very small and very charming," displays a calmer sensibility than her hysterical fiance. Also like The Rasp, The Choice has sudden turns and illuminating writing by MacDonald, such as "[t]he yellow flood of light swayed back, rushed through the doorway; sent flying the darkness between the doorway and the waiting men..." The Choice is a good choice for those who enjoy 1930s puzzle mysteries. Leo Harris, who introduced the 1994 Chivers reprint of The Choice, stated that he could not understand the reason for the title, but I think it refers to a certain decision by the doctor's wife. Golden Age British mystery author and journalist Anthony Berkeley Cox, aka Anthony Berkeley and Francis Iles, was born today in 1893. He died in 1971. Cox, a founder of the Detection Club, created sleuths Ambrose Chitterwick and Roger Sheringham, and his The Poisoned Chocolates Case (1929), Before the Fact (1931; adapted as the Hitchcock film Suspicion), and Trial and Error (1937; adapted as the film Flight from Destiny) appear on the Haycraft-Queen Cornerstone list. He also contributed to the Detection Club's round-robin mysteries The Floating Admiral, Ask a Policeman, and Six Against the Yard. The screen version of his novel Malice Aforethought appeared last year on PBS's Mystery! series, and Crippen & Landru has published a collection of his short stories. For more on Cox's life and work, see Elusion Aforethought: The Life and Writing of Anthony Berkeley Cox by Malcolm J. Turnbull (Popular P, 1996). "The question will be, not, 'Who killed the old man in the bathroom?' but 'What on earth induced X, of all people, to kill the old man in the bathroom?'" --Anthony Berkeley, preface to The Second Shot (1930), on the future of the detective story.